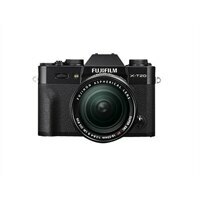 Fujifilm X Series X-T20 - Digital camera - mirrorless - 24.3 MP - APS-C - 4K / 30 fps - 3x optical zoom - Fujinon XC 15-45mm OIS PZ lens - Wi-Fi - blackTurn the dials. Look through the viewfinder. Shoot in stunning colors. Capture the moment. The FUJIFILM X-T20 packs advanced technology into its beautifully designed compact and lightweight body so you get the most from your photography whatever you choose to shoot. Capture images exactly as you see them with dial-based controls and a variety of exposure modes, or select Advanced SR AUTO for intelligent, fully-automatic shooting. The FUJIFILM X-T20 has a large, fast viewfinder. It also features a tilting TFT color LCD monitor suitable for both above head and close to the ground shooting. By combining the touch shot function with the tilt LCD monitor, you can get even more creative. Turn the dials. Look through the viewfinder. Shoot in stunning colors. Capture the moment. The FUJIFILM X-T20 packs advanced technology into its beautifully designed compact and lightweight body so you get the most from your photography whatever you choose to shoot. Capture images exactly as you see them with dial-based controls and a variety of exposure modes, or select Advanced SR AUTO for intelligent, fully-automatic shooting. The FUJIFILM X-T20 has a large, fast viewfinder. It also features a tilting TFT color LCD monitor suitable for both above head and close to the ground shooting. By combining the touch shot function with the tilt LCD monitor, you can get even more creative.